Parents, business owners and taxpayers are asking many good questions about the finances and pragmatic results of our own district. Ultimately, why do we want a school district, and how will it work out? Some of these questions cannot be answered at this time until an actual board exists to make those decisions. We are on step A… those questions are steps M through Z. But, we’ve assembled some common FAQs so you may find answers for yourself and those you talk to. We also have a copy HERE of the $30,000 WISTAX study on this very issue in 2009 that contains, if anything, low estimates of our financial benefit from such a change. Feel free to print this page and share it with your neighbors! Not a single member of the Racine Unified school board is a resident of Caledonia. With our own district, all of the board members will be from our community and will be accountable to its residents. No more referendums will be imposed on Caledonia unless we actually vote for it. According to the last verifiable numbers, Caledonia currently pays over 20% of the RUSD tax bill and yet our students only receive a little over 11% of the spending. These numbers will soon be updated through a government-financed study. We expect them to be even greater with economic changes and the explosion of open enrollment. Our own school district all of our tax money is spent right here in our community on our children. That means Caledonia school district could be able to continually lower taxes once it is established. The current law governing the creation of school districts can be found HERE. 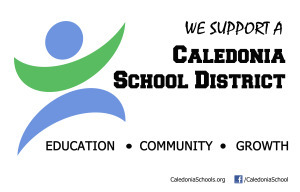 According to the statute, Caledonia receives revenues equal to it’s proportion of the previous RUSD school district. This means that since Caledonia already has most of it’s infrastructure (4 schools, one large lot), pre-separation, our taxpayers should not bear the initial shock of paying for a school district without state revenues. This is a change from 2008, and would be retained in any change we seek. In order to attract new residents and businesses, we need to provide an excellent public education system. We also need to show that we have autonomy and control over the direction of our education. Caledonia students are already among the best in the state, but they are averaged in with the rest of Racine Unified. 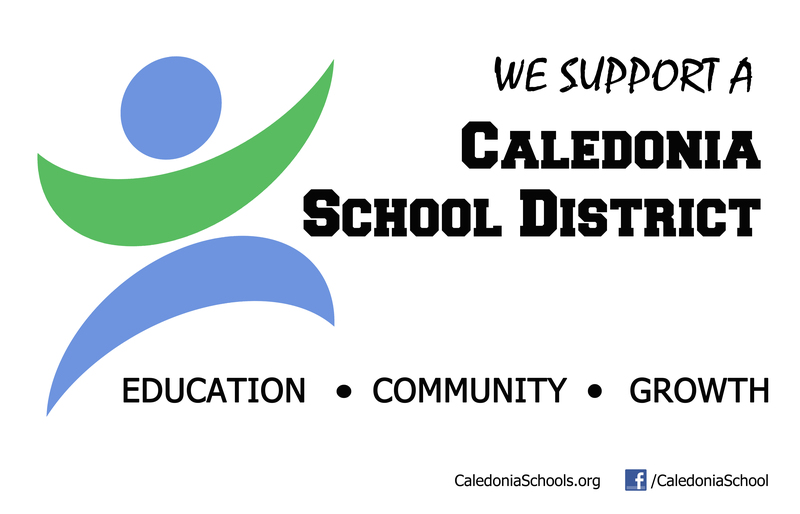 With our own district, our students will receive the recognition they deserve and everyone will see that Caledonia is a great place to live, work and visit. How will this affect my property taxes? Most of the extra costs for Caledonia are in the building of a new high school. New school districts also require start up costs and are not fully funded by the state of Wisconsin until the third year. The first year’s mil rate will be established by the first elected board, but because of recent reforms in financing and existing surpluses may come in about even upon a split. I want my child to continue in RUSD. Is this possible? Yes, Wisconsin is an Open Enrollment state, meaning you can your child in any school district you wish as long as the district has space. Existing students are grandfathered in. Also, 12th graders have the right to finish at the high school they attended regardless of space. What happens to the school buildings located in Caledonia? The new Caledonia school district would receive all the schools in Caledonia: Olympia Brown, North Park, Caddy Vista and Gifford Elementary. A large 26 acre parcel of land by 5 1/2 mile and Novak would also be included in the asset/liability split with Racine Unified. How much will a new school district cost Caledonia residents? According to the June 2008 study by WISTAX, the new Caledonia school district would net approximately $44 million after the asset/liability split. These numbers are expected to improve under new state and school district financing rules. However, a new high school would be needed. The average cost of a new high school is approximately $65 million; this amount can be bonded over several years, but most of it would likely be covered by the payout. The cost to local residents would be minimal over the short term, and likely lower in the long run. Who are you and where can I get more information? We are a group of concerned citizens who would like to see Caledonia thriving to continue to attract new residents and businesses. In order for this to happen we need strong schools and involved citizens that want ownership in their community schools. Questions were assembled from multiple sources over 6 years of the Caledonia effort.